A new track and a new league to skate on it will open in the San Francisco area next spring. As if the debut of the bank at RollerCon later this month isn’t exciting enough, today comes word that there are real and tangible plans to bring another banked track into the world in a major roller derby market. Venom Sports Productions, a new initiative in the Bay Area of northern California, has announced that it has purchased a brand-new Kitten Traxx banked track. 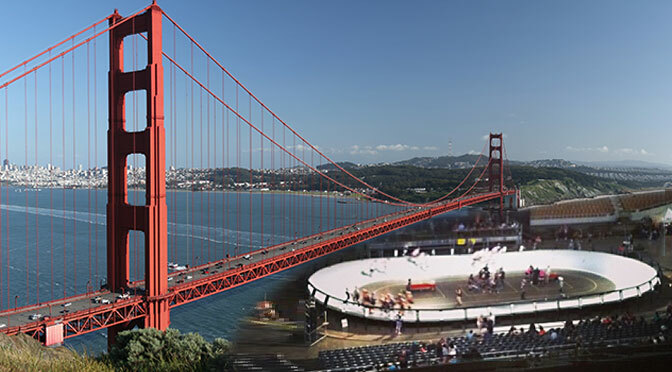 With it, VSP will create the Bay Area Black Widows, a modern roller derby league to skate on it. They hope to debut in the Spring of 2016. The league will be headed by Vanessa “Hell Raze Hurr” Velarde, a skater with over 10 years of derby experience in both the modern flat track scene and on the banked track. As someone with “derby in her blood” and an addiction to the speed and thrills of the high banks, Velarde and her partners have been looking for a track of their own to get more directly involved in the growth of the modern iteration of banked track derby. “We have been searching for a banked track for over a year now,” remarked Gaggero. “And it happened! A Kitten Traxx track fell out of the sky and into our laps. Who would have guessed? They say when you stop looking, it happens.” According to the Black Widows, the track was purchased “from a private party” in Arizona that built it from scratch, but never skated on it in anger. Though the principals of the new league have a foot in today’s professional and traditional version of the game that is the San Francisco-based American Roller Skating Derby, the Widows made clear that they are going down a new-school path, having already decided to play by RDCL roller derby rules and aim to eventually become full members of the coalition. The Bay Area Black Widows are currently in the process of “putting the puzzle together” for their hopeful launch next year. A handful of skaters have already committed. The team feels the time is right for there to be growth, not only in their own numbers, but for banked track derby nationwide. In the past year, new tracks in Texas and Florida were raised, and VSP and the Widows want to continue that trend. “We just think it’s a natural progression. We are forecasting more and more modern day banked track leagues in the next decade. We also have recruited a few male skaters in hopes of seeding a modern day men’s banked track league, too. How do I get more information. I left the Arizona derby dames to move back home. Now there’s a bank track coming to me!! Looks like they’ve recently created a Facebook Page. Good place to start? so now it’s a Big 6 league, eh?